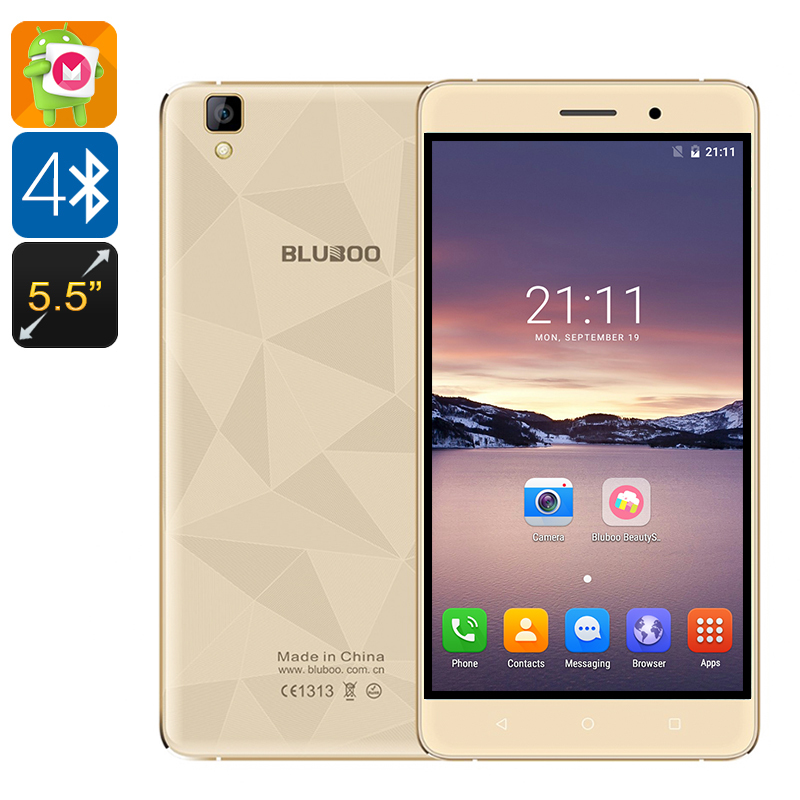 Successfully Added Bluboo Maya Smartphone - Android 6.0, Quad-Core CPU, 5.5 Inch HD Display, 2 IMEI, Smart Wake, Gravity Sensor (Gold) to your Shopping Cart. The new Bluboo Maya smartphone features an extraordinarily beautiful design from the outside while holding some serious hardware within. Crafted out of aviation level aluminum this Chinese smartphone is ultra-thin. By combining modern industrial engineering and classic style, Bluboo has come up with a unique Diamond-Texture design that has been integrated on the back of the Maya smartphone, making this a truly eye-catching phone that is guaranteed to turn some heads. Holding a 5.5 inch HD display this Android phone lets you enjoy all your media in stunningly sharp quality. Its IPS display comes with a 1400:1 contrast ratio thanks to which it delivers rich colors and higher contrasts – providing a marvelous visual experience. Along with this Chinese smartphone comes an Android 6.0 Operating System that lets you enjoy all the latest features the mobile industry has to offer. Simply open any application straight from your locked screen, or navigate through your smartphone without actually touching your screen – Smart Wake and Gesture Sensing technology will enhance your overall user experience significantly. Featuring a powerful Quad-Core CPU that has been clocked at 1.3GHz and 2GB of RAM the Bluboo Maya smartphone lets you enjoy all your media to the absolute most. Download millions of free Apps with Google Play and enjoy the latest movies and games in mesmerizing detail. Thanks to its powerful hardware this Chinese Android Phone will meet with all your mobile media demands without dropping a single frame. Equipped with a 3000mAh battery the Bluboo Maya has enough juice to get you through the most demanding of days. Carry around a professional-grade camera in your pocket at any time. Featuring a mesmerizing 13MP camera that holds a customized Sony image sensor and a quick focusing lens, this smartphone allows you to capture fabulous pictures in a flash. Additionally, this camera features some of the latest facial recognition technology that allows it to snap a picture automatically when a smile is detected. With this magnificent mobile camera you will capture clear and colorful images as if you were a professional photographer. The Bluboo Maya smartphone comes with a 12 months warranty, brought to you by the leader in Android Smartphones as well as wholesale electronic gadgets..